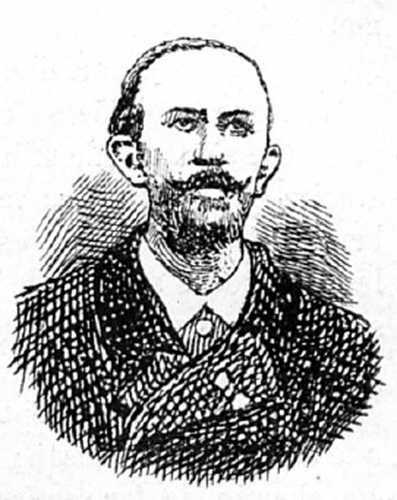 Emile Nouguier was Head of Methods Department at the Eiffel Enterprises. Emile-Toussaint-Michel Nouguier was born in Paris on February 17, 1840. At the end of his studies, he prepared for the Ecole polytechnique and was eligible in 1801. He entered the School shortly afterwards. National Superior Mines; he graduated in 1866 as a graduate engineer. He became from 1867 to 1876 one of the active employees of the house Ernest Gouin (today Batignolles Construction Company), first as a head of the studies office, then as construction site engineer. In this important house, he collaborated in all the works that he carried out during this period of nine years, including the construction of the Palais de l'Exposition Universel in 1867, the construction of the bridge on rue Brémontier in Paris (belt railroad); the Volga bridge at Rybinsk (with spans of 110 meters and a length of 475 meters); from the bridge of Margaret Island on the Danube to Pesth (with six arches and a total length of 570 meters). France: Pont d'Empalot with compressed air foundation: bridges of Valentine and Sarrieu for the Compagnie des railways du Midi; grand vestibule of honor of the 1878 World Fair; bridge of the Cubzac road, on the Dordogne, with a length of 552 meters; La Tardes viaduct, on the Montluçon-Eygurande line, 250 meters long, in three spans, the central span having 104 meters of opening and being located 80 meters above the bottom of the valley. Note that these two last works were set up without scaffolding. Garabit viaduct, 564 meters long, the central arch having 165 meters opening with a height of 124 meters. The assembly was made cantilever without scaffold. Portugal: Douro bridge in Porto, 364 meters long, with a central arch 160 meters wide and 60 meters high; the erection of this bridge cantilevered and without scaffolding was repeated at the viaduct of Garabit cited above; Vianna Bridge, on Lima, for a railroad and a road, 750 meters long, with foundations executed by compressed air at a depth of 25 meters; viaducts of the Minho, Douro and Beira-Alta lines. As a reward for all these works, Mr. Nouguier received from the King of Portugal the cross of Commander of the Order of Christ. Spain: Bridges and viaduct of the Gerona line on the French border; large bridge over the Tagus, dike from Madrid to Cacères; bridges of the line of Asturias-Galicia and Leon, among which we must mention the bridge of Cobas, in a single span of 100 meters. As a reward for this work, Mr. Nouguier was named Knight of the Order of Isabelle-la-Catholique. Romania: Bridges of the railway line from Ploiesti to Predeal. Hungary: Large arch bridges on the Theiss in Szegedin, 606 meters long, with a 110-meter arch lowered to 13, partly cantilevered. We arrive at the Eiffel Tower for which Mr. Nouguier, in collaboration with Mr. Kochlin , with the assistance of Mr. Sauvestre , prepared the draft presented to the government. He then followed the execution of the Tower, studied and directed the assembly, having under him as foreman Mr. Martin for the foundations and the masonry and M. Companion for the metal superstructure. The government gave him justice by awarding him the Knight's Cross of the Legion of Honor on May 6, 1889.